My girl Gina just shared this video review with me, so I’m returning the favor, even though I haven’t finished watching it yet either!! Okay, can I say that I thought the $14.99 price point was a little high until I saw the nice sized Raw Shea Moisture shampoo, conditioner and restorative elixir enclosed!! NICE!!! On another note, DANG!! That was a lot of hair she cut for that “strand test!” “Strand?” That’s singular. That was a hunk!! All they getting out of me is some shed hair from the trash can!! LMBO!! Okay, let me finish watching this!! LOL!! I watched that review yesterday and was blown away with the color and how healthy and shiny her hair looked. But I’m one who has used henna/indigo in the past from time to time. I asked the question on the Shea moisture FB page. They indicated henna on the hair may result in splotchy/spotty results using their color and to definitely do a strand test if trying it. I’ve purchased the dark brown but haven’t gotten the guts to try it yet. After seeing this review, I’m even more tempted. Henna is cool but it’s such a long and messy process that I ‘m really tempted to try this! By the way, at my Target here in Chicago it’s priced at $14.99. Chuck, when was the last time you hennaed? If it’s been a few months, you may be okay! And, with a dark brown, you probably won’t have a problem as the lift is not high for that color. But, you’ll probably have reddish undertones. A strand test with some some shed hair is a good idea though. As to the price, THANK YOU!! I’m going to correct that!! See, I watched the video and just guessed at what she said it cost because I didn’t feel like going back and finding it!! LOL!! Yeah I hennaed almost two montjs ago so I agree, I may be safe. I purchased the dark brown and the dark auburn shea moisture color kits. I think I’ll initially try the dark brown because if its splotchy I figure it really won’t show too bad since my hair is already dark brown. I mainly just want to find an easier and healthy way to cover my grays. If it works well, I’ll then try the dark auburn down the line. Once I try it, I’ll let you know how it worked for me, but of course, I’ll definitely strand test prior to. Well, I just did the dark brown and all I can say is, WOW! I can’t believe how well the color took! I have no splotchiness, my grays and hennaed highlighted strands are completely covered, in fact I can’t find one of them. It’s amazing. And I only had it in my hair about 20 min. My texture and curl pattern reminded exactly the same. And my hair is very moisturized! I am more than happy and it sure beats the time and final outcome I get with the henna/indigo combo that I was doing! The dark brown is extremely dark so I may go up a color next time but I am completely pleased! This is good to hear Chuck!! I really want to try Shea Moisture’s Color and I have been doing henna/indigo/amla treatments for about 2 yrs (usually only every 2- 3months) because the process is sooo long!! I just ordered a ton of henna/ too (because its time for a touch up next week! I haven’t done henna/indigo since Christmas and I only used it to make my hair very dark brown/black to cover my grays. Henna/indigo (2 step process most of the time and then 1 step the last 2-3) does not work in coloring my grays very well…just leaves me with reddish strands and it doesn’t last long. Within 6 wks you can see my grays again…so that is why I am considering this! My hair past my shoulders curly so I am sure I would need 2 boxes…also I read on the you tube video comment (of the young lady who did an awesome review) that someone did use the blonde on dark brown hair but she used 2 boxes…I really would like to get more of the chestnut blondish brown color vs. going dark brown black…before I was natural I had chestnut blondish brown highlights that looked really good & covered/blended my grays very well….I am just afraid of using “permanent” color….esp since this still has hydrogen peroxide…before I did henna/indigo, I used a semi permanent rinse from Sally’s (dark brown) that broke off some of my hair….I think I used the wrong developer for the semi-perm so I waited several months (6) before I did henna….the time it takes to do henna/indigo is crazy with my extra long curly hair….plus I just bought Morcoccan Henna & Indigo….maybe I can sell to someone? What do you think? Maybe I should wait another month before trying Shea Moisture & I will definitely do a strand test first. The artwork on the boxes are BOMB! Its pretty much why I would get all of them lol. I would sell the dye and keep the boxes. LOL. My parents are from Haiti so I pretty much started stucking teeth before they (teeth) came in LOL. Wow…her hair looks great, even though I henna, I think I may try this bright auburn. I love henna but the process is long and indigo is iffy on my grays. Hi Anon! Yeah, the bright auburn is NICE! I’d love to see it in the light! In the comments, she said that the video didn’t do the color justice! As to the henna and indigo process on your greys, do you do the two-step process? I always get great coverage with the 2 step. But, mixing the two for a dark brown? Nada! Just doesn’t do anything but make the red slightly toned down. But, the process is definitely long, which is why I only do it about once every 8 weeks now. I am a henna head. But this review was excellent, good to know there are options out there if I ever chose to take the box color plunge. I love SheaMoisture products but I am a little disappointed the dark golden blonde didn’t work for dark hair. I love golden and honey blonde color but I don’t like the damage that comes along with it so I switched to henna for my color fix and my hair had been much healthier. I think if that golden blonde color worked in her hair I would have immediately ran to the closet Target to snag lol. I was disappointed the blonde didn’t work too UniquelyCurly! The thing is, everyone’s hair is different. So, just because it didn’t work on her, doesn’t mean that it won’t work on anyone with darker hair. When she said that you shouldn’t bother if your hair is dark, I was a little surprised because that’s what a strand test is used to determine. She may have low porosity hair whereas someone else may have high porosity and perhaps it would work for them (though, with high porosity, dar hair, you may not want to mess around with a blonde color!!). It seemed that the box showed the results on dark brown hair, though I may be wrong. But, if it did, then I would think that it may work for some. I’m definitely keeping my eye out for more video reviews!! Though I won’t be going down that round, I’m super curious!! The boxes are really pretty! Being a former model, I do wonder how the models were compensated for their work. Being photographed for a hair box is one of the most lucrative jobs for a model, so I’m just wondering if there is a discrepancy since they chose to do renderings instead of real photos. Just the question mark over my head right now…. From a consumer point of view, they are beautiful! I don’t dye my hair personally, and I have just started using henna but this lovely packaging will certainly jump off of the shelves! wise advertising! JITC,from what I’ve read, these were commissioned watercolor paintings by an artist in Maryland, Mike Jamal. The way they look, they may be women completely from his imagination/mind with some inspiration from photos. Or, perhaps he had models sit for the pieces and they were paid a sitting fee? But yes, very wise marketing! I showed my husband last night after I posted and he brought it to my attention that they probably weren’t real models but artist renderings. He’s a photographer. Hennahead too. I’m gonna pass on this but it’s nice to know it’s there. Her hair came out fabulously! Didn’t it? I really do like the color too!! But, I’m disappointed the blonde didn’t take! I was really interested to see what the results would be like! I know from previous dyeing experience that color does NOT show well in my hair unless I bleach/strip it. I’d love to try a healthy color system like Shea Moisture, but with my hair if it doesn’t lift it doesn’t work. If any black-haired curlies try this, please let me know. i wanna try it. but i just need some color. i’ve become bored with just my “everyday fro” so i need to spice it up…..or do something….. i’m super interested though…. I was all excited until it got to the price! I’ve been doing my box color with Garnier and have had no ill effects (dryness, breakage or damage to curl pattern). My box costs me about $6-I’ll have to wait for more reviews before I take the plunge…this isn’t in my local stores yet anyway…maybe curlbox or curlkit will have it in their boxes??? Yeah, the price is steep. But again, with the size of the hair treatments included, it’s not bad! Say you even paid $2 for each, that would be $6 and that means the dye is only about $9. I’ve dyed many times in the past and that is a lot of product to include in a dye kit. I loved this review and her results. I have newly all natural (6months) after transitioning for 19 months. I would LOVE to color my hair but for the results I want…I would need bleach. When my hair was relaxed I did a two step process including bleach to get the color I wanted for 10 years. My hair is really dark brown some say its black so I may try the same color as in the video and see what my results will be. Love it and don’t mind spending the money on it especially after paying over $200 each time I colored my hair in the past. 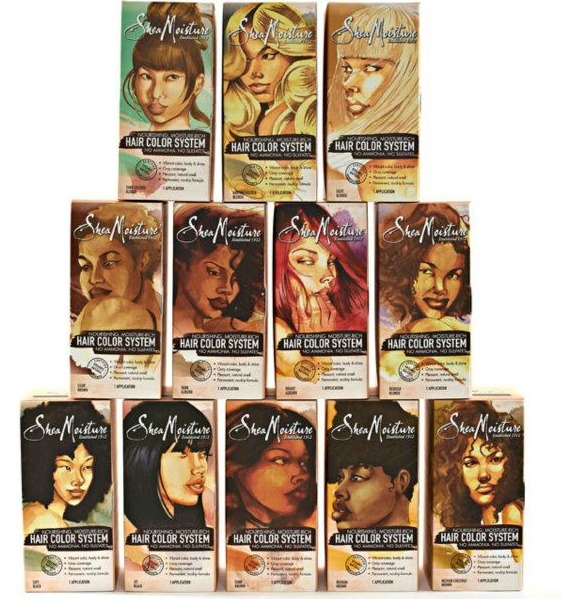 Im having a hard time finding the New Shea Moisture Hair Color System. No target in michigan has it. any suggestions. Anon, try posting on the Shea Moisture FB page. They might be able to help you out as I can’t find locations. I went out and bought 2 boxes right away– the bright auburn for panel coloring in the front, just to frame my face, and the dark auburn for the back. I’ve never done as much as a rinse in the past and even then, my hair stylist did it. Been wanting a color change for a very long time, so wish me luck! Oooooh Tea, that sounds awesome!!! I’d love to see your results!! If I’m not too late, good luck!! There is hope for henna heads who want to try coloring. I have been doing henna treatments for about 2 years and I miss my color. I have always colored my hair (since middle school) and stopped 4 years ago when I started to transition. I have been missing my colored hair though and asked my AWESOME colorist (who happens to be Pakistani) if there is any way to remove the henna if I want to color. She advised me to get a clarifying shampoo (she recommended Redken in the white bottle), shampoo my hair once, reapply the shampoo and let it sit for about 10minutes. She warned that I would HAVE to do a deep condition afterwards because clarifying shampoo would leave my hair feeling very dry due to the “stripping”. I haven’t tried it yet b/c I decided not to get the color last spring but I’m turning up for my 40th this year so I’m going for it. I used the dark auburn, but didn’t like the results. I wonder how long I have to wait before coloring my hair again? This was very helpful; especially about using the bright auburn. Why is always so difficult to track down Shea Moisture products???? In fact, you shouldn’t have to track it down. Geez! Nevertheless, where can I find the color system. No luck at Target or Walgreens… in store or online! @wildcaticus – I too am frustrated by the problems of locating the hair color system. I found it at my local Target here in Chicago a couple of months ago. Used it, Loved it! Now I can’t find it anywhere. I asked about the situation on their fb page. They responded that some of the stores must just need to be restocked. They have a list of stores that are suppose to carry it and after checking with 5 other Targets based on their list, I still had no luck. I again went back to their page and communicated the frustration. They said they are working on setting it up so it can be purchased online and would be announcing when that is possible but I haven’t seen anymore about it yet. It’s bad for those of us who started using it and now can’t maintain it. It took me a long time to decide to color my hair with a dye since I had been using henna previously. I don’t want to have to try to switch back to henna, but I also don’t want to try another hair dye. Meanwhile, my grays are coming in fast and furious. Luckily I have a hair coloring paste to touch up grays. That’s the only thing saving me for now!! Very Frustrating! Sorry… I am just now reading your post. SM needs do a better job of making their products available. Also, my grays are stubborn – what color paste do you use? Thanks!!! I’ve gotten wonderful results using Shea Moisture products, I especially love the restoration oil that came with the dye. I have to admit I didn’t even leave the product in my hair for the time recommended because I was scared lol I hadn’t dyed my own hair in about 10 years so I was very skeptical. The color came out very well and I instantly felt a difference in my hair. The price is a bit much compared to other dyes but I guess when you get the results I got it all makes since and plus the other products that came with the dye aren’t one use products, I dyed me hair almost 2 months ago and I still have the conditioner and the oil, cuz I don’t need to use a lot of it at once, it penetrates damn good. I would love for the price to go down but either way, I’m sold on this product. I went out and bought the black soap conditioner and again that was what $10 o_o I really didn’t want to spend that much on a conditioner but I did and I’ve been using it every week for just about a lil under 2 months and it don’t even look like I put a dent in the bottle, real talk the bottle ain’t even half way gone yet, so overall I am getting my moneys worth. The only thing I don’t like about the product is the lingering scent, Shea moisture has a distinct scent and when u first smell the product it do smell good but Im just not use to smelling a product in my hair after the fact like days later…. that smell mixed with my natural oils is a bit overwelming sometimes (I do have a sensitive nose tho lol). Thanks for the feedback Trisha!! Great to know that you had a good experience with it!! I’m sure this will be helpful to ladies seeking reviews on the line!!! I love the color system but my biggest problem is finding it now. For some reason the Targets that originally carried it here in Chicago no longer have it on the shelves. Last update from Shea Moisture’s FB page indicated they were working to have it available through the Target website but haven’t seen any updates on that. I just checked the Target website and the color system is on there. I got excited at first…problem is they’re all out of stock!! Lol! i recently relaxed my hair (3 weeks) ago . i really wana try this product . is it too soon ??? I don’t know Victoria as I’ve never even seen this product on shelves. Usually the box will tell you how soon prior to or after relaxing that you can use hair color though. You can ask on the SheaMoisture Facebook page. They company will respond and give you the best advice. I am texlaxed and would love to add some color to my hair. The last time I dyed my hair with dark and lovely I was also relaxed and had a lot of breakage. Is this safe to use on texlaxed and relaxed hair? If so should I apply to hair as long as directions says? Please see above response from Chuck Ayla. I henna, so I have no intent to try and haven’t researched it. I have tried all kinds of hair dyes on my natural hair. Nothing worked as well as this brand. I used the medium brown and my hair turned out to look black (not a problem for me), but healthy and extra shiny. My hair has never looked this brilliant before. It took on my grey hair and all. I love it! Now I am temped to use a lighter color in about six months or so. The only down side was my hair texture right after dying and conditioning was very tangled and dry. I put in the deep conditioner by Shea Moisture and used a plastic cap for 30 minutes and that alleviated that problem. I would definitely recommend this dye. BTW – there is henna in this dye as well. I had never colored my hair, I tried shea moisture reddish blonde and loved it. I always purchased from Target but they pulled it off the shelf. They sell it on line but do not offer my color. if you use or want to use this product email write or call Target to have them put it back in the stores. I am pissed because I have a black tie event coming up and I can not gind my trusted color. I use all of their products and I have been natural for 11 years. Carol, it looks like the Reddish Blonde is available on Target online now. Not sure how long that will last though! hi, could you please tell me if the blonde dye’s contain any harsh chemicals such as bleach?? I don’t know anything about the ingredients Anon, but anything that lightens your hair, other than lemon juice, is likely to have peroxide in it. If you google it, I’m sure you’ll find the ingredients. Can u use ths product on relaxed hair? ?